What is Defamation? How Does Arizona Define Defamation? Private vs. Public Defamation Plaintiffs: Which One Am I? ‘Defamation’ is an all-inclusive legal term governing the written, spoken, or published communication of a false assertion of fact to a third-party, which ultimately causes damage or harm to another person’s reputation. Commonly referred to as the “tort of defamation” or “defamation of character,” defamation is categorized as a civil wrong in the United States and other Common Law legal jurisdictions (think Australia, United Kingdom, Canada), and enables plaintiffs to recover monetary damages for their harm suffered. Libel: the written or published communication of a false assertion of fact to a third-party, which subsequently results in harm or damage to another’s reputation. Slander: the spoken communication of a false assertion of fact to a third-party, which subsequently results in harm or damage to another’s reputation. Understanding the difference between both slander and libel is extremely important for defamation victims, as it could mean the difference between bringing a valid claim and being prevented altogether. Typically, slander claims have shorter statutes of limitations for bringing a claim, and both will typically have differing filing and procedural requirements. So, just remember when identifying what type of defamation it is, look to the form in which it was conveyed. And, with our societal shift towards memorializing and documenting everything on the Internet, libel cases have become the most popular type of defamation case out there – so just remember to document and preserve all available online evidence you can by taking a picture or screenshotting it. However, note that the legal term “disparagement” is actually an incorrect classification for defamation, as it deals with derogatory and false statements which are adverse and detrimental to a business or company’s property, finances, or title. Disparagement may also be referred to as the tort of business/commercial disparagement, and is geared towards protecting a business or company’s proprietary rights, rather than an individual person’s reputation. So, what do you call persons who publish and communicate false statements about other persons? Now that we’ve tackled the general principles driving defamation law and its core definitions, let’s take a look at how Arizona defamation law defines the tort of defamation and defamation of character, along with the requisite elements a plaintiff must meet in order to succeed in their libel or slander claim. Arizona defamation law defines a defamatory statement as one that must be “false and bring the defamed person into disrepute, contempt, or ridicule, or impeach her honesty, integrity, virtue, or reputation.” Godbehere v. Phoenix Newspapers, Inc., 162 Ariz. 335, 341 (Ariz. 1989); Turner v. Devlin, 174 Ariz. 201, 203-04 (1993). The plaintiff suffered damage as a result of the statement. Morris v. Warner, 160 Ariz. 55, 62 (Ariz. Ct. App. 1988). It’s also worth noting in the realm of Arizona defamation law, that Arizona courts frequently look to the Second Restatement of Torts, viewing it as a persuasive authority. Sanchez v. Coxon, 175 Ariz. 93, 95 (1993). In this blog post, we’ll address all five fundamental elements required for a successful defamation action in Arizona. Curious about how Arizona’s definition of defamation compares to several other states? You can check out our comprehensive and interactive United States defamation law map here. Online Defamation Law Fact: When confronting online defamation, it’s important to preserve all relevant evidence you can. This includes screenshotting or taking a picture of the offensive material, having a friend or trusted family member do so, and taking any other identifying notes. Ultimately, this will strengthen your defamation claim and help prevent any accusations from an opposing party that you tampered with evidence. Are you an Arizona resident and have been the victim of online defamation or slanderous attacks? Reach out to the defamation removal lawyers of Minc Law today to fight for your reputation. At Minc Law, our nationally recognized defamation removal lawyers boast a nearly 100% defamation removal and takedown rate, and all for a flat, reasonable fee. We’ve litigated in over 19 states and 3 countries, and have secured hundreds of online defamation removals – so, rest assured when working with the defamation lawyers of Minc Law, you’re in good hands. Because libel and slander are highly nuanced areas of law, it’s important to consult an experienced defamation attorney to explore your legal options and formulate an effective defamation game plan. Now that we’ve tackled Arizona’s definition of defamation and the required five elements defamation plaintiffs need to succeed in their claim, let’s take a look at what Arizona plaintiffs need to plead and prove when bringing a claim. Before getting into what exactly Arizona requires defamation plaintiffs to plead when bringing a defamation action, we’re going to take you through what pleadings actually are and the reasons behind them. If you’ve ever watched any legal drama on television, you’ve most likely heard one of the following terms. Essential to all legal actions, pleadings are required formal written statements and documents that must be filed with a court, outlining a party’s claims, issues, and defenses to an opposing party’s claims, issues, and defenses. Pleadings are first brought by a plaintiff – after all, what reason would a defendant have for implicating themselves and opening themselves up to liability for something? Complaint: the first pleading filed by the plaintiff, outlining their core accusations, allegations, and facts which drive their cause of action. Complaints all contain what’s called a “prayer for relief,” or a statement of damages. Answer: a defendant’s response to the complaint filed by a plaintiff, where the defendant “answers” all relevant accusations, allegations, and claims, while raising any specific defenses. Reply: the plaintiff’s response to a defendant’s answer, where they respond to any new issues, facts, or points raised by the defendant. Counterclaim: a claim brought by the defendant against a plaintiff in order to offset specific claims. 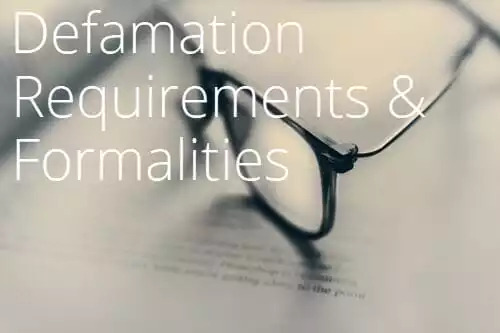 Defamation law is a highly nuanced area of law – with most states differing in their required formalities and procedures – therefore we highly recommend reaching out to an experienced defamation removal attorney to assist you in identifying any relevant legal claims, advising you of important deadlines, and understanding pleading formalities further. As the United States boasts one of the most robust and complex legal systems in the world, it’s important to understand that most states will differ in their respective pleading requirements and formalities. For example, one state may require libel or slander plaintiffs to commence their defamation action within a shorter period of time, while another may have a longer and more “relaxed” deadline. Or, some U.S. states might require a plaintiff to plead specific facts or language when bringing their case, while another may only require a plaintiff to prove a general statement outlining the offensive material in question. So, what pleading standard does Arizona follow for defamation? Arizona follows a notice pleading standard, under which a complaint “shall contain a short and plain statement of the claim showing that the pleader is entitled to relief.” Ariz. R. Civ. P. 8(a)(2). Furthermore, “because Arizona is a notice pleading state, a complaint need only have a statement of the ground upon which the court’s jurisdiction depends, a statement of the claim showing that the pleader is entitled to relief, and a demand for judgment.” Dube v. Likins, 216 Ariz. 406 (Ct. App. 2007). For purposes of pleading, Arizona does not distinguish between “per se” and “per quod” statements. Ariz. R. Civ. P. 9(h). Both will be addressed below. Since Arizona defamation law follows a rather broad pleading standard, is there any way for an Arizona defamation defendant to require a plaintiff to plead their claim with specificity? Upon motion to make a complaint more definite and certain, Arizona defendants may require that the entire article be set forth in the complaint alleging actionable libel. Kinsey v. Real Detective Pub. Co., 52 Ariz. 353 (1938). The Doctrine of Defamation Per Se: What Types of Statements are Considered ‘Per Se’? Also commonly referred to as ‘libel per se’ or ‘slander per se,’ depending on the form in which the statement is conveyed, defamation per se is a legal principle acknowledging that certain statements are so inflammatory and damaging, that a defamation plaintiff need not prove damages. Specifically, Arizona defamation law considers a publication which impeaches honesty, integrity, or reputation of a person to be libelous per se. Peagler v. Phoenix Newspapers, Inc., 114 Ariz. 309, 316 (1977). In Arizona, written communications will constitute libel per se if “on their face and without the aid of any extrinsic matter” they tend to “bring any person into disrepute, contempt, or ridicule” or “impeach [their] honesty, integrity, virtue, or reputation.” Ilitzky v. Goodman, 57 Ariz. 216, 220-221 (Ariz. 1941). Imputes the commission of a crime involving moral turpitude. Modla v. Parker, 17 Ariz. App. 54 (1972). Generally, most U.S. states categorize four types of statements which are so inherently defamatory, that they are considered ‘per se.’ However, Arizona has combined both the imputation of contagious/venereal diseases and unchastity of a woman. Actual malice is proven. Dombey v. Phoenix Newspapers, Inc., 150 Ariz. 476, 481 (Ariz. 1986). Let’s take a look at an example of defamation in Arizona. Doctor vs. Patient: The Arizona Court of appeals vacated a $12 million damages award for a group of doctors who brought claims for libel and false light invasion of privacy against a cosmetic surgery patient who began posting statements on various consumer review websites, complaining of her experiences as a patient, including alleging the doctors were not “board certified.” She also created her own website complaining she had been a “victim,” while warning the public of the doctor’s alleged incompetence and unethical, unprofessional behavior. Desert Palm Surgical Group v. Petta, 236 Ariz. 568 (Ct. App. 2015). On the flip side of the coin is defamation per se’s exact opposite – the legal principle of defamation per quod. Instead of presuming damages, such as in the case of defamation per se, libel and slander plaintiffs will be required to provide extrinsic and supporting evidence of the defamatory nature of the statement(s) in question. As defamation per quod is not associated with presumed damages, plaintiffs must plead and prove “special damages,” a topic we will address in Section 5: Arizona Defamation Damages. Arizona defamation law acknowledges libel per quod consists of written communications which “on their face do not fall within the definition of defamation, but which by reason of special extraneous circumstances actually do,” while slander per quod is “all slanderous utterances which are not slanderous per se.” Ilitzky, 57 Ariz. at 221. Boswell v. Phoenix Newspaper, 152 Ariz. 9 (1986). To recover for defamation per quod in Arizona, plaintiffs must allege special damages, such as lost profits or other “pecuniary loss.” Boswell, 152 Ariz. at 6. So, what is the extrinsic and extraneous evidence a plaintiff must provide in order to succeed in their defamation per quod action? Under Arizona defamation law, innuendo is the extrinsic evidence that a plaintiff is required to prove in a defamation per quod acton. Courts will give the alleged defamatory words their natural and popular construction and reasonable inferences will be ascertained by a reading of the publication as a whole. Yetman v. English, 168 Ariz. 71, 77 (1981). Turner v. Devlin, 174 Ariz. 201, 208 (1993). In a good portion of defamation cases, defendants don’t explicitly come out and communicate a defamatory statement. However, they may cloak and hide defamatory statements in regular speech, giving way to a popular legal principle – defamation by implication. In Arizona, a person may be liable for defamation for what he insinuates as well as what he says explicitly. Phoenix Newspapers Inc. v. Church, 103 Ariz. 582 (1968). For example, the plaintiff need not actually be named in the statement, however the plaintiff will bear the burden of proving that the publication or communication was “of and concerning” him. Hansen v. Stoll, 130 Ariz. 454 (Ct. App. 1981). Defamation Law Fact: In the realm of defamation law, the United States is generally considered a pro-defendant defamation jurisdiction due to its longstanding enforcement of the First Amendment and U.S. Constitution, while other Commonwealth countries (United Kingdom, Canada, Australia) and other European countries and typically considered more pro-plaintiff. If you’re a victim of online abuse and malicious attacks, put an end to it today! Reach out to online defamation removal lawyers of Minc Law now, by calling us at (216) 373-7706, or by filling out our contact form online. As you’ve likely gathered, defamation law in the United States is a highly complex area of law, with varying statutes, definitions, and formalities. In this section, we’re going to take you through several important Arizona defamation formalities and requirements, such as whether Arizona courts can extend jurisdiction over out-of-state defendants, where plaintiffs can sue defamation defendants in Arizona, the time limit for bringing libel and slander claims, and more. First, let’s take a look at Arizona’s jurisdictional reach over out-of-state defamation defendants. Do Arizona Courts Have Jurisdiction Over Out-of-State Defamation Defendants? However, jurisdiction may only be granted over out-of-state defendants if the defendant knew the statements might be published and could cause harm to an Arizona plaintiff. DeMont v. DeFrantz, 303 Ariz. Adv. Rep. 10-12 (1999). Note that all claims for defamation must be filed in the Arizona Superior Court. A.R.S. § 22 503. If you’re unsure of whether Arizona courts have legal jurisdiction over a specific defendant, we strongly recommend you consult an experienced defamation lawyer. United States Defamation Law Fact: Under the SPEECH Act, signed into law by former President Barack Obama, American journalists, writers, and publishers may not have foreign libel judgments enforced against them if the cause is not compliant with the Constitution’s First Amendment. Now that we’ve tackled the main situation where an Arizona court may exercise personal jurisdiction over an out-of-state defamation defendant, let’s take a look at where – and in which venue – a libel or slander plaintiff may bring their action. Where Can Arizona Plaintiffs Sue a Defamation Defendant? In Arizona, the proper venue in defamation actions against editors, proprietors, or publishers “of a newspaper or periodical published in the state” is in the county in which the principal publication office of the newspaper or periodical is located, or in the county where the plaintiff resided at the time of publication of such statement. A.R.S. § 12 401(10). Where the plaintiff resided when publishing the defamatory statements and materials. Defamation Law Fact: The United States has seen its fair share of huge libel verdicts in the last twenty years. Specifically, the highest libel verdict ever rendered was in 1997 and for $222.7 million against Dow Jones. However, the verdict was ultimately dismissed two years later after it was found the plaintiff failed to properly disclose certain audiotapes. As mentioned above, identifying the form in which a defamatory statement is conveyed as it may have implications on the time period you have to commence your defamation action. Now, we’re going to take a look at the requisite time period Arizona requires defamation of character plaintiffs to bring their action within. Simply put, a statute of limitations is a limiting time mechanism, which requires a plaintiff to bring or initiate a legal action within a specific period of time. And, should a plaintiff fail to bring their action within their state’s specific time period, they’ll likely be prevented or barred altogether from bringing their claim. So, what’s the policy behind having a statute of limitations? Prudence & Reasonable Diligence: Statutes of limitations exist in order to prevent plaintiffs from initiating claims years after a cause of action has accrued. As such, plaintiffs are required to file and bring their action within a reasonable time period and with reasonable diligence. Preserve Evidence: The longer a plaintiff waits to initiate or bring an action, the less likely it will be that evidence is still available. After all, it’s not unheard of for defendants or other persons to destroy or lose evidence after several years. Elimination of more “cruelty than justice”: By providing defendants with sufficient time and notice to prepare their case, more “cruelty than justice” is ultimately eliminated. In Arizona, actions for “injuries done to the character or reputation of another by libel or slander” must be commenced within one year after the cause of action accrues. A cause of action will typically accrue when the plaintiff discovers (or should have discovered) the essential elements of the action. Furthermore, the “Agricultural Protection Act” creates a cause of action for false claims concerning perishable food products and has a two-year statute of limitations period. A.R.S. § 3-113(D). Note that false statements made about perishable food products are generally protected under veggie libel laws, which you can read about on our U.S. defamation laws page and interactive map. Specifically, the single publication rule is a legal doctrine which ultimately limits the number of libel or defamation actions a plaintiffs may bring against a publisher for one communication or publication. Simply put, one mass publication only warrants one legal action. Arizona has adopted the Uniform Single Publication Act, which applies to statements made on the Internet as well as in the print and broadcast media. A.R.S. § 12 651. Larue v. Brown, 235 Ariz. 440, 330 P.3d 767 (App. 2014). In Simon v. Ariz. Bd. of Regents, 28 Med. L. Rep. 1240 (Ariz. Super. 1999), an Arizona court treated the hard copy and online publication of a newspaper as a single integrated publication and held that the plaintiff’s defamation complaint was time-barred as measured by the date the newspaper article was made available online. Note that there is an important exception to the Uniform Single Publication Act in Arizona. While The Court of Appeals of Arizona has stated that the general rule is that the statute of limitations begins to run upon publication – they also created an exception which holds that the statute of limitations may instead begin to run upon discovery in situations where the defamation is published in a way that is likely to be concealed from the plaintiff. Clark v. Airesearch Mfg. Co. of Ariz., Inc., 138 Ariz. 240, 242 (Ariz. Ct. App. 1983). For example, the defamation may be concealed in something such as a confidential memorandum or a credit report. Online Defamation Tip: There are several easy and free ways to suppress online defamation and false, malicious information in the Internet search results. (1) Create a blog and start frequently updating it – Google loves positive and consistent content, (2) Make all your social media profiles public and start openly commenting on positive and well-known pages, (3) Interlink all your various online accounts together – doing so will create a giant online spiderweb of positive content. Curious as to how Arizona’s defamation statute of limitations stacks up against several other U.S states’? As we’ve touched on several times now, libel and slander actions will typically vary in their respective statutes of limitations, with slander actions usually being required to be brought much earlier. If you’re a resident of Arizona or any U.S. state and have been the victim of online defamation or slanderous attacks, the defamation lawyers of Minc Law want to fight for your reputation. At Minc Law, we boast a nearly 100% online defamation removal and takedown rate, and have secured hundreds of defamation removals in our tenure. We know the ins and outs of defamation law, and know who to work with in order to secure quick and permanent results. Reach out to us today to schedule your free, initial no-obligation consultation by calling us at (216) 373-7706 or by scheduling a meeting online. When confronting defamation in the United States, it’s extremely important to understand that depending on the status of a plaintiff in society, their legal rights and remedies may greatly differ. For example, United States defamation law acknowledges two core types of plaintiffs: public figures and private figures. In this section, we’re going to tackle the history and case law behind the differences between the two, the policies reasons behind distinguishing between private and public figures, and more. And, we think you might just be surprised to find out which category you fall under. To start, why does U.S. defamation law distinguish between public and private plaintiffs? In 1964, the U.S. Supreme Court ruled on the landmark case of New York Times Co. v. Sullivan, which has ultimately laid the fundamental framework for modern day defamation law in the United States. Specifically, the court found a need to distinguish between private and public defamation plaintiffs in order to further “uninhibited debate of public issues.” After all, certain persons in society have voluntarily or involuntarily availed themselves to the public light, and should thus have a much stricter burden of proof they need to meet when bringing defamation claims. Public Plaintiffs: Think the Donald Trumps, Kenny Chesneys, and Emma Stones of the world. These people are considered public figures and public plaintiffs, due to their voluntary (or involuntary) availment to the public light, comment, and scrutiny. And, it is in our society’s best interest to have “uninhibited debate” surrounding the persons who are shaping our everyday social, legal, political, and economic policy. In order to succeed in a libel or slander action, public plaintiffs must prove a defendant acted with actual malice or reckless disregard. Private Plaintiffs: If you’re reading this and haven’t held any major position of power or influence in your community or spotlight, then you likely fall under the category of “private plaintiff.” Private plaintiffs are persons who have not voluntarily or involuntarily availed themselves to public comment, criticism, or scrutiny. And, because private persons have not opened their lives up for the entire world to see and comment on, they have a lesser burden of proof to meet when bringing a libel or slander claim (think about it, they never asked to have their name and reputation dragged into public debate). As such, private plaintiffs are only required to prove a person acted with ordinary negligence when publishing or communicating a false assertion of fact – aka a defamatory statement. Below is a comparison table highlighting the core differences between the four types of defamation plaintiffs recognized in Arizona and their relevant case examples. Definition Plaintiffs who have no voluntarily or involuntarily availed themselves to the public light, criticism, or comment. Public officials are typically persons among the hierarchy of government and persons who have pervasive influence over government affairs. To be classified as a public figure in Arizona, a person must have achieved “such pervasive fame or notoriety that he becomes a public figure for all purposes and in all contexts.” Dombey, 150 Ariz. at 480(quoting Gertz, 481 U.S. 323, 351 (1974). The Arizona Supreme Court has recognized that an individual may become a limited-purpose public figure for certain events or controversies when he “voluntarily injects himself or is drawn into a particular public controversy.” Dombey, 150 Ariz. at 480. In determining whether a person is a limited-purpose public figure, Arizona courts will consider whether the person has “thrust himself or his views into public controversy to influence others” and whether the person’s “position with respect to the matters of public concern gives him access to the media on a regular and continuing basis.” Id. Finally, the Dombey court held that a person is “not automatically transformed into a public figure just by becoming involved in or associated with a matter that attracts public attention.” Rather, the person must assume a position that invites attention. Id. Burden of Proof Liability may be proved by showing that the defendant acted with actual knowledge of falsity, or with reckless disregard of the truth, or negligently in failing to learn the truth. Peagler v. Phoenix Newspapers, Inc., 114 Ariz. 309 (1977). Actual malice – typically on all matters public and private Actual malice Actual malice – but generally only in the instant or occasion where the defendant availed themselves to the particular controversy. Arizona courts have found the following individuals and organizations to be private figures: (1) A company selling an electronic parts catalog where the company was not involved in any public controversy prior to the defendant’s allegedly defamatory statements. The Court specifically held that the company’s use of advertising did not make it a public figure. Dealer Computer Servs., Inc. v. Fullers’ White Mountain Motors, Inc. No. CV07-00748-PCT-JAT, 2008 U.S. Dist. LEXIS 83311 (D. Ariz. Oct. 16, 2008). (2) A corporation selling diamonds and other precious stones, despite its use of mail and telephone solicitations. Antwerp Diamond Exch. Of Am. Inc. v. Better Bus. Bureau of Maricopa Cnty., Inc., 130 Ariz. 523, 527 (Ariz. 1981). Arizona has held the following categories of persons to be “public officials” for purposes of applying the New York Times v. Sullivan Standard: (1) Student senators. Klahr v. Winterble, 4 Ariz. App. 158 (1966); (2) Police officers. Turner v. Devlin, 174 Ariz. 201, 204-05 (1993). (3) Teachers. Sewell v. Brookbank, 119 Ariz. 422 (Ct. App. 1978). (4) Narcotics agents. Hansen v. Stoll, 130 Ariz. 454 (Ct. App. 1981). (5) County sheriff. Godbehere v. Phoenix Newspapers, Inc., 162 Ariz. 335 (1989). (6) FAA inspector. Lewis v. Oliver, 178 Ariz. 300 (Ct. App. 1993). Public figures are typically politicians, celebrities, and other notable figures in the community or public. (1) Furthering the scope of public figures in Arizona, the Arizona Supreme Court held that an agent of record for the health and life insurance programs of county employees should be considered a limited-purpose public figure. Dombey v. Phoenix Newspapers, Inc., 150 Ariz. 476 (1986). (2) Furthermore, the Arizona Supreme Court held that a plaintiff “Romano,” an admitted organized crime enforcer who had “turned state’s evidence” against an Arizona crime boss, was a limited-purpose public figure. Ultimately, they emphasized the voluntary nature of Romano’s “reputational self-exposure,” the public interest in his testimony, and the eventual limelight that Romano’s life as a “career criminal” had invited. Scottsdale Publishing, Inc. v. Superior Court (Romano), 159 Ariz. 72, 75, 80-81 (Ct. App. 1988). Arizona courts have ruled on numerous limited-purpose public figure cases, so below are some additional examples painting a better picture of what exactly constitutes an LPPF in Arizona. A World War II veteran who had authorized a biography and solicited press coverage of that work. Thomas v. Los Angeles Times Commc’ns. LLC, 45 Fed. Appx. 801, 803 (9th Cir. 2002). The insurance agent of record for an Arizona county, where the insurance agent made recommendations resulting in substantial expenditures from the public and financially benefited from his position – although he was not actually employed by the county. Dombey, 150 Ariz. at 484-485. (Discussed above). An individual, in suing his former employer for defamation, who had contacted the media regarding his claims of wrongful termination and sent his complaint to approximately twenty companies in related business fields. Prendville v. Singer, 155 Fed. Appx. 303, 305-06 (9th Cir. 2005). Keeping in line with the idea of public and private figures, we’re now going to turn to issues of public and private concern, which also enjoy differing burdens of proof and degrees of protection under Arizona defamation law. Going hand in hand with the idea of private and public figures is the notion of private and public issues. And, depending on the nature of an allegedly defamatory statement, a person’s burden of proof may be stricter or more relaxed. Should the United States fail to differentiate between issues of public and private concern, ultimately our media, news stations, and democracy would suffer, as information would likely be censored or vetted in controlled ways. The United States Constitution and First Amendment have consistently upheld the idea that our general public should receive uncensored and unabridged information from news and media sources, therefore our courts have historically held a need to differentiate between both public and private issues. For example, like statements made about public figures – which require a showing of actual malice or disregard – public issues should be discussed openly (and without fear of legal repercussion), thus the burden of proof is the same. And, keeping with the standard for private figures – ordinary negligence – statements made about private issues typically only require a showing of ordinary negligence. Arizona defamation law and courts apply a negligence standard to defamation claims brought by private figures seeking compensatory damages (also known as actual damages). In Arizona, public officials, all-purpose public figures, and limited-purpose public figures must prove that the defendant acted with actual malice – knowledge that the statements were false or made with reckless disregard for the truth. Peagler v. Phoenix Newspapers, Inc., 114 Ariz. 309, 315 (Ariz. 1977). In dicta, the Arizona Supreme Court observed that if defamation involves “a matter of public concern,” a jury may not award presumed or punitive damages absent a showing of actual malice. Boswell v. Phoenix Newspapers, Inc., 152 Ariz. 9, 19 (1986). However, an Arizona appellate court has held that in cases brought by private plaintiffs that do not involve matters of public concern, “Dun & Bradstreet rather than Gertz is controlling,” meaning that a jury could find libel per se to support presumed damages even absent a showing of actual malice. Hirsch v. Cooper, 153 Ariz. 454, 458 (Ct. App. 1986). Defamation Law Tip: If you own a business or company, it’s important you set aside a specific budget for online reputation and brand monitoring. Doing so is an effective way to not only understand how the general public and community views your company or product, but is also essential for identifying intellectual property infringers early on. If you’ve been attacked or defamed online and you’re unsure of what exactly constitutes an issue of private or public concern, reach out to an experienced defamation lawyer today. Now that we’ve taken you through the essentials of bringing a defamation of character claim in Arizona, let’s take you through how to defend one and the numerous defenses persons can rely on when facing a libel or slander action. In the wild world of defamation law, even if a part communicates a defamatory statement, there’s still a plethora of defenses they can rely on in order to skirt defamation liability. Below are just some of the most common defenses to the tort of defamation in the United States and Arizona. Let’s get started with possibly the most popular defense to libel and slander actions in the United States – the defense of opinion. It’s important to remember that when dealing with defamation, it concerns the false assertion of fact – meaning that what is being communicated must be able to be independently proved true or false for it to constitute defamation. However, if a statement is not verifiable as fact, then it will likely be considered opinion, and thus protected under defamation law. The Arizona Supreme Court has adopted the standards set forth in Milkovich v. Lorain Journal Co., holding that the Arizona Constitution “provides no greater privilege for otherwise defamatory statements than the First Amendment of the United States Constitution.” Yetman v. English, 168 Ariz. 71, 82 (1991). In Milkovich, the Court found that a defamation action must be based on a false assertion of fact, and a statement of opinion, so long as it “does not contain a provably false factual connotation [,] will receive full constitutional protection.” Milkovich v. Lorain Journal Co., 497 U.S. 1, 20 (1990). Post-Milkovich, Arizona courts have yet to make it expressly clear exactly what types of statements do or do not state or imply an assertion of objective fact. We can however take a look at the below examples, which provide the best guidance currently available of what types of statements constitute objective fact. Communist: In Yetman, the court held that a Republican state representative’s reference to a Democratic county supervisor as being a “communist” could be construed as a statement of fact. Yetman v. English, 168 Ariz. 71 (1991). Police officer conduct: Two years after Yetman, an Arizona court held that a school nurse’s statements that a police officer was “rude and disrespectful” and that “his manner bordered on police brutality” were not actionable because they were “subjective impressions, unprovable as false.” Turner v. Devlin, 174 Ariz. 201, 209 (1993). Pure opinion: The Arizona Supreme Court does recognize pure opinion as protective speech, though it’s unclear whether this recognition survives Turner/Milkovich. MacConnell v. Mitten, 131 Ariz. 22, 25 (1981). As noted above, for a statement to be actionable under Arizona defamation law, it must be provable as fact. It’s also important to remember that while the truth may hurt, it shouldn’t be censored and controlled. Under Arizona defamation law, truth is an absolute defense to defamation actions. Central Arizona Light & Power Co. v. Akers, 45 Ariz. 526 (1935). Substantial truth will also be considered a complete defense and should be determined by the court as a question of law. Central Arizona Light & Power Co. v. Akers, 45 Ariz. 526 (1935). In Arizona courts consider a statement to be “substantially true” if viewed “Through the eyes of the average reader” it differs from truth “only in insignificant details.” Curries v. Western Newspapers, Inc., 175 Ariz. 290, 293 (1993). Specifically, substantial truth will be found where the crux or “gist” of a statement is still true, but for slight, immaterial inaccuracies. Simply put, if the sting is still felt by the plaintiff, then the statement will be considered substantially true and protected. Furthermore, truth is an affirmative defense in Arizona defamation of character cases, and must be pleaded. Broking v. Phoenix Newspapers, Inc., 76 Ariz. 334 (1953). Where no legitimate claim or privilege exists, an Arizona defendant has the burden of proving truth as a defense. Id. And, where the plaintiff is a public figure, he bears the burden of proving with convincing clarity that the defendant acted with knowledge of falsity or in reckless disregard for the truth. Id. Finally, the Arizona Supreme Court has stated that, “in cases involving matters of public concern, the Common Law presumption of falsity must give way to First Amendment interests and that, therefore, the Common Law allocation of burden of proof would be reversed; instead of the defendant having the burden to prove truth, the plaintiff would have the burden of proving falsity.” Dombey v. Phoenix Newspapers. Inc., 150 Ariz. 476, 481 (1986). What is Privilege? What Types of Statements Are Privileged in Arizona? While ‘privilege’ might sound like a complex and confusing legal term, it’s actually pretty simple and straightforward. Think of privilege as your God-given or legal right to communicate a specific statement at a certain time. Specifically, privilege refers to a party’s legal right, enjoyment, or entitlement to publish or communicate a statement – regardless of its contents. As you’ve likely gathered by now, United States defamation law and is strongly aligned with protecting First Amendment principles of free speech and open debate – privilege is no different. Without the doctrine of privilege, our democracy would fail to modernize and protect our God-given rights in such a robust and comprehensive way. Furthermore, our political, judicial, social, and economic policies would slowly erode due to the inability of legislators to discuss contentious and hot-topic issues. In this section, we’re addressing the most fundamental legal privileges relied on by persons and defendants in the United States and Arizona. Absolute privilege is at the top of the privilege food chain, and refers to a party’s legal right, entitlement, or enjoyment to publish or communicate a statement in a specific situation, even if the contents are defamatory. Absolute privilege is so comprehensive that it even applies to persons who have communicated or published a statement with actual malice or disregard. So, in what types of situations is absolute privilege typically granted? Due to the comprehensive nature of absolute privilege, it is an essential for our core decision making processes (judicial, political, legal, economic, and social), as developing robust and thorough policies requires the presentation of the flipside of the coin and open comment/criticism. Arbitration proceedings: Statements made by witnesses in private contractual arbitration proceedings. Yeung v. Maric, 224 Ariz. 499 (Ct. App. 2010). Decision making processes: Statements made in the context of judicial proceedings, legislative proceedings, and administrative or executive functions of government, as long as the recipient of the communication has a direct interest in the litigation, or processes evidentiary information directly relevant to it. Bailey v. Superior Court of Santa Cruz County, 130 Ariz. 366, 368 (Ct. App. 1981). Judicial pleadings: Statements made in judicial pleadings if connected with or related to subject of the inquiry. Drummond v. Stahl, 127 Ariz. 122, 126 (Ct. App. 1980). Lawsuit apprising: Statements made for the purpose of apprising a part of the basis or status of a lawsuit are considered made “in furtherance of” litigation. Recorp Partners, Inc. v. Gust Rosenfeld, P.L.C., 198 Ariz. 230 (Ct. App. 2000). Direct relationship to proceeding: Absolute immunity will apply to communications with no-parties who have a sufficiently close or direct relationship to the judicial proceeding. Hall v. Smith, 214 Ariz. 309 (Ct. App. 2007). The recipient of the communications must have some relationship to the proceeding. Johnson v. McDonald, 301 Ariz. Adv. Rep. 7, 9 (Ct. App. 1999). Qualified privilege can be viewed as absolute privilege’s younger sibling, due to not being as comprehensive as absolute privilege and attaching in much fewer circumstances. Also known as “Common Interest Privilege,” qualified privilege refers to a party’s legal right, entitlement, oy joy to publish or communicate a specific statement to a specific audience. And, oftentimes, such audience must have a reciprocal interest in hearing such statement by the speaker. Typically, qualified privilege is granted to persons in positions of trust and authority, who have a legal, moral, or social duty to further and overhaul change or policy. Unlike absolute privilege, which extends to statements even made with actual malice or reckless disregard, qualified privilege will be defeated and unavailable as a defense in cases where a person has published a statement with actual malice or disregard. In Arizona, the qualified or conditional privilege is another type of defense to a defamation action, and it’s based on the social utility of protecting statements required to be made in response to a legal, moral, or social duty. Aspell v. American Contract Bridge League,122 Ariz. 399 (App.1979). Editorials: Statements made in editorials published in the “public interest” were qualifiedly privileged in Arizona. Klahr v. Winterble, 4 Ariz. App. 158 (1966). Public records: Statements contained in public records, which are required to be kept by public officers in furtherance of their statutory duties (pursuant to A.R.S. § 39 121) will be protected under qualified privilege in Arizona. Union officials: Arizona recognizes qualified privilege for statements made by union officials acting pursuant to official duties. Ross v. Duke, 116 Ariz. 298 (Ct. App. 1976). Common interest: Statements made to others who share a common interest in the subject matter thereof are qualifiedly privileged in Arizona. Hirsch v. Cooper, 153 Ariz. 454 (Ct. App. 1986). Government officials: Statements made by high-level government officials within the scope of their duties will be protected under qualified privilege in Arizona. Chamberlain v. Mathis, 151 Ariz. 551, 560 (1986). Public proceedings: Statements that are fair and accurate reports of public proceedings are qualifiedly privileged in the state of Arizona. Green Acres Trust v. London, 141 Ariz. 609, 618-19 (1984). Sexual harassment: Statements made by an employee to an employer reporting perceived sexual harassment in the workplace will be protected under Arizona qualified privilege. Miller v. Servicemaster By Rees, 174 Ariz. 518, 520 (Ct. App. 1992). Public officials & discharge: Communications made to public officials concerning matters that affect the discharge of their duties are qualifiedly privileged in Arizona. Lewis v. Oliver, 178 Ariz. 330 (Ct. App. 1993). Administrative actions: Statements made by government employees in the course of discretionary administrative actions will be protected under qualified privilege in the state of Arizona. Carrol v. Robinson, 178 Ariz. 453 (Ct. App. 1994). Keep in mind that except in those cases where the facts of the occasion are in dispute, whether a statement is covered by a conditional or qualified privilege is to be ruled on by the court as a matter of law. Roscoe v. Schoolitz, 105 Ariz. 310 (1970). Fair comment privilege is a specific type of privilege geared towards the protection of statements concerning public figures, officials, and matters of public interest. Simply put, fair comment guarantees freedom of speech and freedom of the press, and will protect persons who publish statements about public figures as long as they are not made with ill will, spite, or an intent to harm. In Arizona, fair comment privilege protects “the honest expression of defamatory statements of opinion so long as they are drawn from a true or privileged statement of fact, unless such statements are made with Common Law malice.” Yetman, 168 Ariz. at 74. Under Arizona defamation law, the fair comment privilege “is limited to discussions of matters which are of legitimate concern to the community as a whole because they materially affect the interests of all the community.” Phoenix Newspapers, Inc. v. Church, 103 Ariz. 582, 595, (Ariz. 1968). However, note that if actual malice is proved, then fair comment privilege and protection will be defeated. Id. Furthermore, fair comment privilege protects both media and non-media defendants when the plaintiff is a public official. In 1993, the Arizona Supreme Court ruled that regardless of the defendant’s media status, “when the plaintiff is a public official and the speech is of public concern, the plaintiff bears the burden of showing that a statement is provably false before an action for defamation can lie.” Turner v. Devlin, 174 Ariz. 201, 205 (1993). Not to be confused with fair comment privilege, fair report privilege protects organizations and persons who rely on official and government reports and documents and publish them. Such privilege exists to promote trust and faith in our core government processes. After all, if you can’t rely on a government report (and are punished for doing so), then what can you rely on? However, for persons or organizations to be protected under fair report privilege, they must rely on the reports and documents in good faith, and must not materially alter their contents when publishing. Under Arizona defamation law, radio and television owners, licensees, or operators “shall not be liable for damages for a defamatory statement published or uttered … by one other than the owner, licensee or operator, or agent or employee thereof, unless it is alleged and proved … that the owner, licensee, operator or agent or employee has failed to exercise due care to prevent publication or utterance of the statement in the broadcast.” For purposes of clarity, “due care” is defined “to include a bona fide compliance with federal law or regulations of a federal regulatory agency.” A.R.S. § 12 652(A). Radio and television station owners, licensees or operators will also enjoy an absolute privilege for publishing or broadcasting defamatory statements made by, or on behalf of, a candidate for public office. A.R.S. § 12 652(B). Furthermore, editors, publishers and proprietors of newspapers or periodicals are privileged to publish “a report, proceedings or other matter … at the instance of a public officer acting in compliance with law.” A.R.S. § 12 653. Unfortunately, the precise scope of fair report privilege in Arizona (also known as the public records privilege) is not entirely clear. For example, in Sallomi v. Phoenix Newspapers Inc., 160 Ariz. 144, 147 (Ariz. Ct. App. 1989), the Court of Appeals of Arizona held that the “public records privilege” applied to newspaper articles which were comprised of information obtained from interviews with police officers – which are not public record – however, because the information obtained was available in the affidavits, indictment, and booking slip, the privilege applied. Commonly known as the “neutral reportage” privilege, neutral report is a Common Law privilege and exception to rule of republication, which holds republishing parties equally as liable for defamation as the original author or publisher. So, why does neutral reportage exist? Neutral report exists in order to protect news organizations, journalists, and other media, as they are frequently reporting on highly contentious and public issues and “back and forths” between notable public figures. After all, our society has an important interest in hearing the communications (even if defamatory) between two politicians or other notable figures. Although no Arizona appellate court has had occasion to decide whether the neutral reportage privilege applies, after a 1988 libel trial, the Arizona Supreme Court directed a verdict for defendants in part because alleged defamatory statements were protected by the neutral reportage principle. Godbehere v. Phoenix Newspapers, Inc., 15 Media L. Rep. 2050, 2052 (Ariz. Super. Ct. Maricopa Cty. 1988). Additionally, it seems that the 9th Circuit has discussed the adoption of the neutral reportage privilege in other jurisdictions, but they do not appear to have specifically adopted it themselves. Flowers v. Carville, 310 F.3d 1118, 1128 (9th Cir. 2002). Defamation Law Fact: There’s countless defenses to libel and slander in the United States and Arizona, however, the above tackle the most commonly relied upon defenses. Some other defenses relied on by defamation defendants include: (1) No publication or dissemination to a third-party, (2) accidental or innocent publication and dissemination, (3) consent, and (4) mere vulgar abuse. For reference, below is a table comparing the core privileges relied upon by Arizona and U.S. defamation defendants. Definition The apex and most comprehensive form of privilege, which enables person’s to communicate or publish a statement in certain situations – even if it’s defamatory. A less comprehensive privilege than absolute privilege, which enables persons in positions of trust and authority to communicate a certain statement to a specific audience (who typically has a reciprocal interest in hearing it). A legal right granted to both media and non-media defendants who publish matters of legitimate concern to the public. A legal right granted to organizations and persons who publish defamatory statements made by, or on behalf of, public figures and officials. A legal right granted to persons and organizations who republish defamatory and false statements made by public figures/officials against one another. United States Defamation Law Fact: Food disparagement laws, also referred to as veggie libel laws or food libel laws, are defamation laws protecting food manufacturers and producers from libelous and defamatory communications about their perishable food products. As of 2018, only 13 U.S. states have some form of veggie libel laws codified. Think back to Section 1, where we broke down the elements required for a successful libel or slander action. What was the fifth element? Damages. Sometimes there are some plaintiffs and persons in a community who already have such a reviled reputation, that a defamatory statement doesn’t do any damage whatsoever, or the damage is miniscule. Welcome to the libel-proof plaintiff doctrine. The libel-proof plaintiff doctrine will only apply in severe cases, such as where a plaintiff is notorious in their small community for crime, drug abuse, or drug dealing. Arizona courts have yet to adopt the libel-proof plaintiff doctrine. Scottsdale Pub, Inc. v. Superior Court in and for County of Maricopa, 159 Ariz. 72 (Ct. App. 1988). Rarely used, but still relevant to media and news organizations, the wire service privilege protects news and media organizations who publish communications and information received via a wire service from a “reputable news service” or other source. In In re Med. Lab. Mgmt. Consultants v. Am. Broad Cos., 931 F. Supp. 1487, 1492 (D. Ariz. 1996), an Arizona district court held that the wire service defense applied to a Phoenix television station that broadcasted an edition of “Prime Time Live,” but had no role in the planning, reporting, production, or editing of the broadcast. Section 230 of the Communications Decency Act (CDA) is a piece of controversial legislation immunizing websites and Internet Service Providers (ISPs) for defamatory and false information and content posted to their websites by third-party users. Section 230 of the CDA is at the heart of online defamation and at the heart of our practice, as it limits recovery for online defamation victims to primarily the individual poster or online troll. But for a few specific exceptions, the CDA is all-encompassing, providing near-blanket immunities for websites and ISPs. In Arizona, an Internet website hosting company was found to be immune under the Communications Decency Act from a defamation claim brought by a business owner. Specifically, the Court stated that because the CDA provides immunity to interactive computer service providers – like the defendants who provided website services for the plaintiff and ultimately refused to take down an allegedly defamatory statement that the plaintiff was about to face criminal charges – the defendant was not liable for defamation. Austin v. CrystalTech Web Hosting, 211 Ariz. 569 (Ct. App. 2005). If you’re unsure of whether you have an actionable claim for libel or slander, reach out to the defamation lawyers of Minc Law today! The defamation lawyers of Minc Law have removed over 25,000 defamatory pieces of content from website and forums online, so rest assured you’re in good hands. At Minc Law, we boast a nearly 100% online defamation removal rate, and all for a flat, reasonable fee. As mentioned in Section 1, in order for a defamation plaintiff to succeed in their libel or slander claim, they must prove damages. Damages are awards – usually quantified in monetary form – which are granted to plaintiffs in order to compensate or reimburse them for the harm or damage suffered as a result of a defamatory publication or statement. Under Arizona defamation law, damages will be presumed without a showing of actual damages if a “publication … impeaches the honesty, integrity, or reputation of a person, or which is damaging to his professional reputation.” Hirsch v. Cooper, 153 Ariz. 454, 458 (Ct. App. 1986). It’s important to note that the court in Hirsch indicated that a public figure must actually demonstrate actual malice before recovering presumed damages. Id. Just as how defamation per se is associated with presumed damages, the legal principle of defamation per quod is associated with special damages, as a plaintiff must provide extraneous and supporting evidence of the defamatory nature of the statement in question. Under Arizona law, plaintiffs must specifically plead special damages. Ariz. R. Civ. P. 9(g). When a statement or publication is libelous per quod in Arizona, special damages must be pleaded and shown. Berg. v. Hohnstein, 13 Ariz. App. 593 (1971) (citing Ariz. R. Civ. P. 9(g)). Also known as compensatory damages, actual damages are awards granted to plaintiffs who typically suffer a quantifiable or tangible injury (such as emotional distress, depression, anxiety). In Arizona, jury instruction to presume damages from words that are slanderous per se is considered erroneous. Nelson v. Cail, 120 Ariz. 64, 68-69 (Ct. App. 1978). Often referred to as “exemplary damages,” punitive damages are awarded to plaintiffs in order to punish defendants who communicated or published a defamatory statement in an especially wanton or malicious manner. Punitive damages are typically enforced in cases of fraud, deliberate violence, or gross negligence. Under Arizona defamation law, damages cannot be awarded absent proof of knowledge of falsity or reckless disregard for truth. Dombey v. Phoenix Newspapers, Inc., 150 Ariz 476, 481 (1986); Schmitz v. Aston, 3 P.3d 1184, 1204-05 (Ct. App. 2000). Definition Damages associated with defamation per se, which are presumed to the inherently defamatory and inflammatory nature of the statements in question. Damages associated with defamation per quod, which require a plaintiff to provide extraneous evidence proving a statement or publication’s defamatory nature. Tangible and real damages suffered by a plaintiff. Damages awarded to plaintiffs in order to punish a defendant who published or communicated a defamatory statement in an especially egregious or malicious manner. How to Prove Plaintiffs need not prove damages. Plaintiffs must specifically plead and show special damages. Generally, plaintiffs are required to prove a proximate cause or relationship exists between the actual harm and the defamatory statement. Plaintiffs must prove a defendant acted with knowledge of falsity or reckless disregard for the truth when publishing or communicating a defamatory statement. Defamation Removal Tip: Defamation law is a highly nuanced and complex area of law, therefore we strongly recommend you reach out to an experienced defamation attorney to help you formulate an effective defamation removal game plan. Q. What effect has the Internet had on speech in the state of Arizona? A. In a 2007 libel case, an Arizona court stated, “…if a person has a cause of action based on speech, and the First Amendment does not prohibit the action, the party is free to pursue it. That same principle applies to anonymous speech on the Internet. Those who are wronged by anonymous speech still have a right to seek legal redress, if the First Amendment does not prohibit the cause of action being pursued.” Mobilisa v. Doe, 170 P.3d 712, 715 (Ariz. Ct. App. 2007). Q. Are there legal protections for anonymous speech in Arizona? A. Yes. In fact, Arizona courts have applied tests that are highly protective of anonymous speech. Let’s take a look at the popular case of Mobilisa v. Doe. In Mobilisa v. Doe,170 P.3d 712 (Ariz. Ct. App. 2007), an Arizona court was confronted with the task of determining whether to compel discovery of an anonymous defendant. The trial court applied the “summary judgment” test as established in landmark case Doe v. Cahill, 884 A.2d 451 (Del. 2005), which requires a plaintiff to make reasonable efforts to notify an anonymous poster about the pending discovery request for their identity and to put forward substantial evidence for each elements of the claim (other than those which are dependent on knowing the identity of the defendant). Initially, the court ruled against the plaintiff Mobilisa, however, several months later they ruled that Mobilisa had made a sufficient showing to justify unmasking the anonymous Internet defendant. Subsequently, the email provider and anonymous defendant appealed. A plaintiff must put forward enough evidence, which is then independently balanced on its strengths by the court against the need for disclosure and speaker’s claim to First Amendment protection. The court rejected Mobilisa’s argument that a more lenient standard and test should apply because the action was based on a property claim – the unauthorized “hacking” of a computer system – rather than defamation. In another important case for anonymous online speech in Arizona, an Arizona court followed Doe v. Cahill, 884 A.2d 451 (Del. 2005), and adopted the “summary judgment” standard and test, ultimately denying the plaintiff’s motion to expedite discovery. The court concluded that the plaintiff (Best Western) had not produced sufficient evidence to overcome the defendants’ qualified First Amendment right to engage in anonymous speech. Additionally, the court stressed that Best Western had failed to identify a single false statement made by the anonymous defendants, a single item of confidential information posted on the site by them, or a single instance where Best Western’s mark was improperly used. Best Western International v. Doe, 2006 WL 2091695 (D. Ariz. 2006). Q. Can Arizona defamation defendants retract, correct, or clarify their statements prior to litigation? A. The Arizona Supreme Court has ruled that the state correction statute in fact violates the abrogation clause of the Arizona Constitution (Art. 18 § 6). Boswell v. Phoenix Newspapers, Inc., 152 Ariz. 9 (1986). Furthermore, the Arizona correction statute did not apply to publications or broadcasts made within 30 days preceding an election “if such publication or broadcast is designed to in any way influence the results of such election.” A.R.S. § 12 653.05. One Arizona federal court has held that the retraction statute applies only to “libel actions based on newspaper or magazine articles” and does NOT apply to comments made on an online forum. Dealer Comp. Servs. V. Fullers’ White Mt. Motors, Inc., No. CV07-00748-PCT-JAT, 2008 U.S. Dist. LEXIS 83311 at *19 (D. Ariz. Oct. 16, 2008). Q. Does Arizona have any criminal defamation laws in their books? A. Simply put, no. Arizona’s criminal libel statute was repealed in 1978. Q. Can Arizona residents bring a defamation action against out-of-state defendants? A. Yes. Personal jurisdiction may be granted over out-of-state defendants under Arizona’s long-arm statute, as libel and defamation torts “are generally held to occur wherever the offending material is circulated.” Ariz. R. Civ. P. Rule 4.2(a). However, jurisdiction may only be granted in cases where the defendant knew the defamatory statements might be published (and cause harm) to plaintiffs in Arizona. DeMont v. DeFrantz, 303 Ariz. Adv. Rep. 10-12 (1999). Q. What are SLAPP Lawsuits? Does Arizona have any Anti-SLAPP statutes in place to combat them? A. Short for “strategic lawsuit against public participation,” SLAPP lawsuits are frivolous actions brought by persons or organizations seeking to intimidate, censor, scare, or otherwise burden a person with legal costs and time. Such lawsuits are heavily looked down upon and highly unethical. Q. What is the legal doctrine of Prior Restraint? Does Arizona enforce it? A. Prior restraint concerns a government’s censorship of a communication or publication before it’s even published. In Arizona, there have been no notable cases in relation to restraining the publication of defamatory material prior to its publishing. If you’re a resident of Arizona or any other U.S. State and have been the victim of malicious and defamatory online attacks, contact the defamation removal lawyers of Minc Law today! At Minc Law, we boast a nearly 100% online defamation removal rate, have removed over 25,000 defamatory, negative, and unwanted web pages and content from the Internet, and have worked with over 1300 clients! The defamation lawyers of Minc Law know the ins and outs of United States defamation law, and have worked tirelessly with numerous website administrators, content managers, and third-party arbitration firms to secure swift and permanent defamation removals. Put an end to the online abuse and attacks today! Courtesy & Respect: We treat all clients with the utmost respect and courtesy, as we understand how invasive and overwhelming online defamation can be. At Minc Law, your goals are our goals, so rest assured knowing we always have your best interests at heart. Open Dialogue & Communication: It’s not unheard of for some lawyers to go radio silent once the defamation removal process has commenced. At Minc Law, we will stay in frequent contact with you concerning the details of your defamation removal and take down. Minc Law Gets Results: Know that businesses and websites respond to Minc Law and our nationally recognized lawyers. That’s right, we’ve removed over 25,000 defamatory and negative online web pages and content pieces from the Internet. Online defamation is like a wildfire – the longer you let it sit and spread, the more damage it’s going to do to your personal and professional life. Don’t hesitate and contact the defamation removal lawyers of Minc Law to schedule your free, initial no-obligation consultation by calling (216) 373-7706 or by filling out our contact form online.